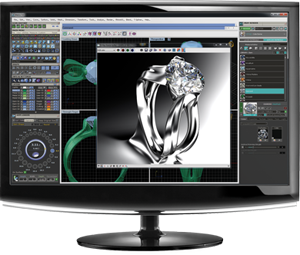 At Gerald's, we use a sophisticated Computer Aided Design program to create one-of-a-kind custom jewelry. With this computer animated design technology, your imagination becomes reality. Upon completion of your design, a 3-D rendering will be completed and you will be able to view the animated rendering in real time. Once the rendering is approved, our expert craftsman will start production on the piece. During this step you will have the opportunity to view and approve a live wax model of your design. Once approved, your piece is cast, assembled, and the Gemstones set. With three generations of custom-design experience, we have the expertise and qualifications to make your jewelry dream become a reality.